With more than 100MN users, Solo is one of the fastest and the most downloaded launcher on the Google play store. It is counted among the top 5 personalization apps in the Android marketplace. This app has 2 million ratings (average is 4.5 out of 5 which is quite impressive). Let’s find out the key reasons why solo launcher has become one of the must-have apps for Android devices. If you’re not happy with the preinstalled launcher in your phone or if you’re facing some issues with it, download Solo. To do this, start your Android handset and open the Google play store app. Install Solo and set it as the default launcher. Don’t worry! This app won’t remove other launchers installed on your device. The Solo launcher is based on Google’s Material design. After its installation, this app will add some new features to your handset. 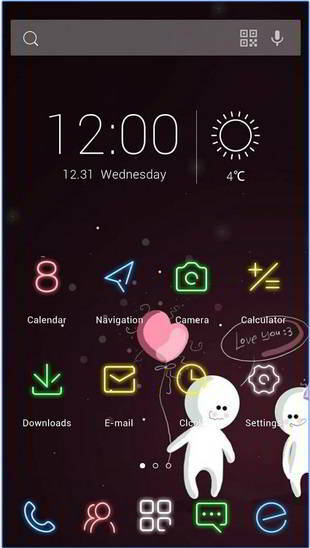 It adds two utilities on the home-screen, a powerful search utility and a widget that shows the current date, time, and weather. This widget supports 12 and 24 hours time format. Solo weather powers its weather utility. To know the climate of your city or area, enter the name or zip code. The search bar displays trending topics in search engines (you can disable this feature from the settings). It supports voice search feature. Solo will automatically detect all the apps on your phone, and it will list them in one of the following two modes. The 1st mode will show your applications in an alphabetically sorted list. The 2nd mode will keep display all your apps in 4 x 5 layout based grid. The default solo launcher settings are perfect, but if you want to change the appearance, theme or effects, long press on any space on your phone’s screen. App Drawer: Open this tool to change icon shape and label color. There are ten different shapes and 15 colors to choose from. Effects and layouts: Along with its three predefined layouts, Solo launcher supports custom layout. It includes 16 attractive animation effects. Icon size: It allows you to increase or decrease the dimension of the icons. 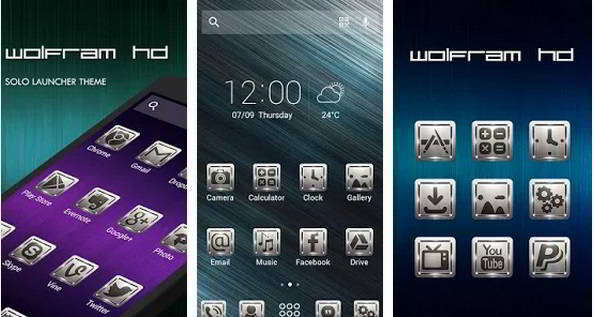 Folder: This launcher can create Android L or IOS style folders. Apart from the utilities mentioned above, DIY tool in Solo Launcher allows users to disable Android status bar, notification toggle, icon labels. You can also activate the lock desktop and infinite scrolling feature from the DIY settings tool. Solo Launcher allows you to choose a background image from your phone gallery, or you can activate any of the pre-installed live wallpapers in case you don’t want to set a still image as a wallpaper. If internet connection is available on your Android device, you can download wallpapers shared by other Solo Launcher users. The search utility that appears on the home-screen of your handset’s display can be customized. Well, you can’t modify its look or behavior, but you can easily switch from Solo search to a better search provider i.e., Google or Bing. To turn off the search feature on apps, contacts, messages, music files, etc or to disable the suggested search keyword (i.e., hot word), visit Solo launcher settings. This tool will free up system memory immediately after you run it. Solo cleaner identifies and kills idle apps to improve the performance of your Android tablet or phone. As idle processes are stopped, the battery backup will improve. Final Verdict: This launcher performed well on my Xiaomi phone. It was fast and smooth. Solo offered a lot of customizations options, and it didn’t crash the Android OS nor did it affect the performance of other apps or games. It consumed 14.9 MB space on the internal storage memory of my phone. Solo is a good replacement to your default Android launcher. It has many features and customizations to make your Android device unique and more productive.